I wasn’t keen on the art – sometimes I found it really cute and cartoony, and sometimes it just became a little too simplistic for my taste and didn’t work, and sometimes my opinion changed between panels. The colours are bright and poppy and the character designs are distinctive – Molly in particular, I love her looks and she is now my favourite reaction image – but the drawing style itself just wasn’t my thing. Especially as the backgrounds are very simplistic, sometimes to the point of becoming boxes of colour, old-school style. As for the story… Hm. I was interested in the mystery and the ghost, and the suspicious behaviour of those around Cel was interesting without verging too far into “Oooh, is it all in her heeeead!” which is a trope I despise. (There are characters who explicitly say that they don’t believe that there is a ghost, but it’s not presented as casting doubt on the reality of the story itself, if that makes sense.) I liked the friendship Cel forms with Molly and Molly's girlfriend Gina, and I don’t know if I was supposed to be happy about what happened to Cel’s boyfriend or take it as part of her mental illness making her lash-out at those around her, but I was glad it happened. While it doesn't go into much depth about the medical practises of the sanatorium (the author does specifically acknowledge that she's not included much, and that she couldn't cover the abuse of specifically women of colour as much as the topic deserves), what we get is equal parts fascinating and horrifying. However, from the way the story is set up, I expected something much worse to be waiting for Cel when she finally found the resolution to the mystery; from the way it was set up, I was half expecting there to be an actual undead cult, rather than the rather mundane immorality that we got. Plus, I thought there would be more of the actual archives involved, which disappointed me a little as a library nerd who explicitly picked this up for the archives and anxiety. The story does go into Cel's mental health as well. For the majority of book, she is strongly against getting traditional treatment even in the face of losing her job – it’s a consistent thread through the story that she feels afraid to fill her prescriptions, that she feels guilty for not taking advantage of the help available to her when she’s surrounded by evidence of how much worse treatment for mental illness used to be, and that she is terrified of getting sectioned (involuntarily committed) – and believes that if she can save the ghost she can save herself. This is a fairly standard trope that in this case I had to talk over a lot with justira because of one scene. I read this ("Wouldn’t you want to know that there was anything, anything at all, you could do to save yourself from the worry and the anxiety and the pain?") 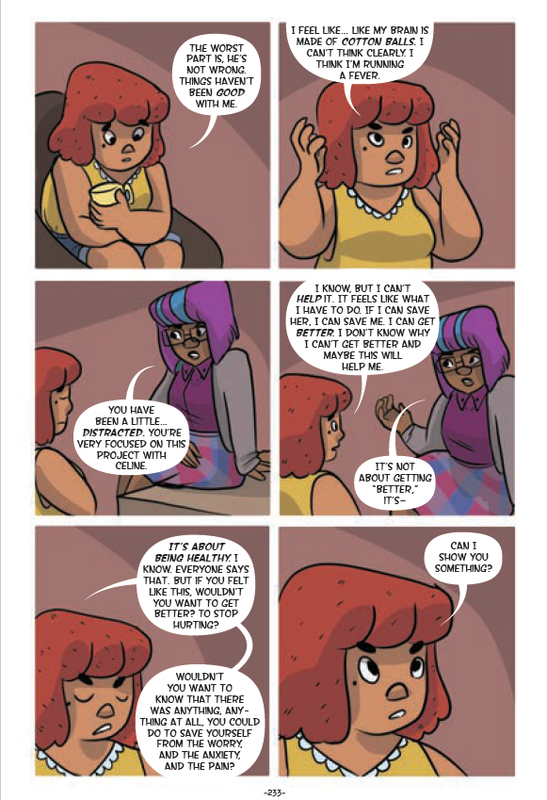 as disingenuous and in direct conflict with Cel's characterisation and attitude towards treatment through the story thus far, and it took Ira to point out that maybe she was speaking generally about the frameworks they were using ("I want to get better" vs "being healthy") instead of about her own situation. I genuinely had not thought of that as an option, but now that it's been pointed out I can see it. It reads confusingly to me, which probably explains my conflicted feelings! I am gonna get SO MUCH USE out of it! :D It's definitely interesting, especially because haunted archives are a thing I like, so if you check it out I hope you like it!